Professor Ashley Jackson began his academic career at New College Oxford where he completed a master’s thesis on Anglo-Australian finance during the First World War (1993) and a doctoral thesis on Southern Africa and the Bechuanaland Protectorate during the Second World War (1996). Since then, the study of the Empire at war, particularly between 1939 and 1945, has been his core area of research and publication. His research developed initially as an exploration of numerous aspects of the war relating to Africa and in particular the High Commission Territories (Basutoland, Bechuanaland, and Swaziland). Botswana 1939-1945: An African Country at War was published by Oxford University Press in 1999, this period of research also accompanied by articles on the Second World War in Botswana Notes and Records, African Affairs, the Journal of Military History, and the Journal of Southern African Studies, and a foray into the First World War with an article on Bechuanaland and the Caprivi Strip in War and Society. Jackson’s attention next moved to the war experience of Mauritius and the wider Indian Ocean region, leading to a second monograph, War and Empire in Mauritius and the Indian Ocean, published by Macmillan in 2001, with associated articles, in The Journal of Army Historical Research and the Journal of Indian Ocean Studies. The third book project was more ambitious in scope; an attempt to provide an overview of the war experience of the entire Empire. The British Empire and the Second World War was published by Continuum (now Bloomsbury) in 2005 and attracted acclaim in the national press and academic journals. Following this, Jackson’s research on the British Empire remained concentrated on the Indian Ocean region as a neglected theatre of operations, and on the strategic role played by Ceylon and other colonial territories. An article on the war’s impact on Ceylon appeared in War in History in 2009, and a book, Suez to Singapore: The War in the Indian Ocean Region, is under contract with Harvard University Press. An article on military migrants in Ceylon appeared in the journal Britain and the World: Historical Journal of the British Scholar Society in 2013, and an article on the war work of the Colombo dockyards in the Journal of Indian Ocean Studies in 2002. In 2008 Jackson wrote an article summarizing the British Empire’s contribution to the First World War for BBC History Magazine (reprinted in the 2012 First World War Special Issue). Book chapters on aspects of the war, such as the role of colonial governors and the strategic role of colonies, appeared in Andrew Stewart’s Diplomats at War (2008) and Greg Kennedy’s The Old World Order: Imperial Defence, 1856-1956 (2008). In 2010 Jackson edited a two-part collection of essays on new research on the Second World War and the British Empire in the journal Global War Studies and wrote an article on the Empire and the Second World War, featuring research on Africa as a strategic continent, for The Round Table: The Commonwealth Journal of International Affairs. An article on the Empire’s war effort appeared in a Second World War Special Issue of BBC History Magazine. Also in 2010, Distant Drums: The Role of Colonies in British Imperial Warfare was published by Sussex Academic Press, a collection of past articles and new essays on aspects of the British Empire at war. In the following year, a biography Churchill was published by Quercus. Other work related to the British Empire and twentieth century warfare, particularly the history of British Special Forces, the Royal Navy’s East Indies Fleet, and British counterinsurgency in the post-war period, has appeared in publications such as the British Army Review, Defence Studies, and the Royal United Services Institute for Defence Studies Journal, and in 2012 a chapter on non-European recruitment and the British military appeared in Alan Jeffrey and Patrick Rose, The Indian Army: Evolution and Development, 1939-1945, along with a chapter on the Second World War at sea in Thomas Zeiler’s Wiley-Blackwell Companion to the Second World War. Whilst continuing his research on the war in the Indian Ocean region, in 2012 Jackson’s research took a new turn as he began working on an AHRC-funded project (with Yasmin Khan as Principal Investigator) on the Second World War in India, Iran, and Iraq. Jackson is Professor of Imperial and Military History at King’s College London. From 1996 until 2004 he was a Research Fellow at Mansfield College Oxford and Director of the Visiting Student Programme, and before joining King’s College spent a semester as Lecturer in Imperial and Commonwealth History at Oxford Brookes University. Jackson’s other books are Mad Dogs and Englishmen: A Grand Tour of the British Empire at its Height (Quercus, 2008), Illustrating Empire: A Visual History of British Imperialism (with David Tomkins, Bodleian Library, 2011), The British Empire: A Very Short Introduction (OUP, 2013), and Buildings of Empire (OUP, 2013). He is a member of the editorial board of the journals Global War Studies and The Round Table: The Commonwealth Journal of International Affairs. Dr Yasmin Khan: I was born in London to a mixed family background which included Pakistani, Argentinian and Irish grandparents. This made me consider the global nature of my family history and also of the Second World War from a young age. I was educated at St Peter’s College and St Antony’s College Oxford where I was awarded a DPhil in 2005 in Imperial and Commonwealth History. My thesis concentrated on the Partition of India and the creation of Pakistan and was turned into a narrative history of Partition which was published by Yale University Press in 2007. I’ve held a British Academy Postdoctoral Fellowship, a lectureship at the University of Edinburgh and was Lecturer and Senior Lecturer at Royal Holloway, University of London for five years in the Department of Politics and International Relations before joining the Department for Continuing Education and taking up a University Lectureship in Global and Imperial History at Oxford in 2012. My current research interests are in the global ramifications of the Second World War for India and the great movements of people and things which accompanied the war in South Asia. I’m currently writing a narrative history of this event which tries to place it in a transnational framework and draws attention to the mass involvement of Indians in global theatres of war, but also to the changes brought about in Indian cities by militarisation. With Ashley Jackson I was awarded an AHRC grant in 2012 to pursue this subject in comparative depth with a comparison of the Middle East. I’m interested particularly in the social repercussions of war time mobilisation and militarisation and recently published an article on the subject in History Workshop Journal. 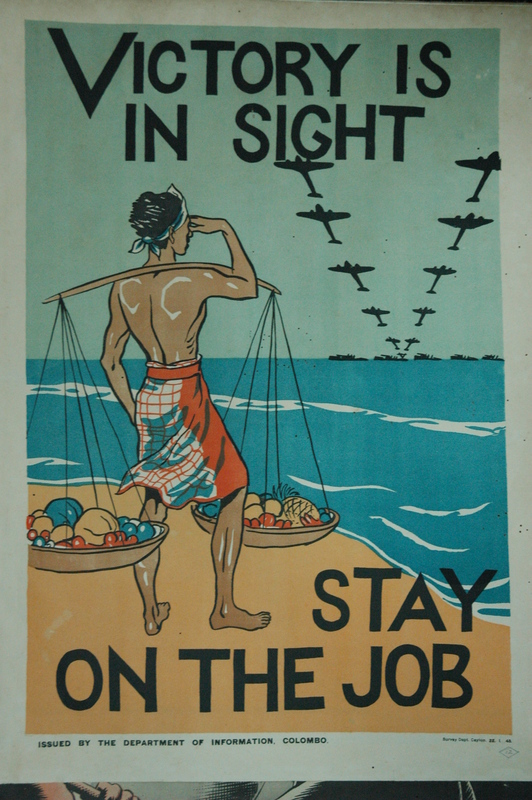 A poster aimed at sustaining morale on the Sri Lankan home front during the Second World War. Copyright Sri Lanka National Archives.